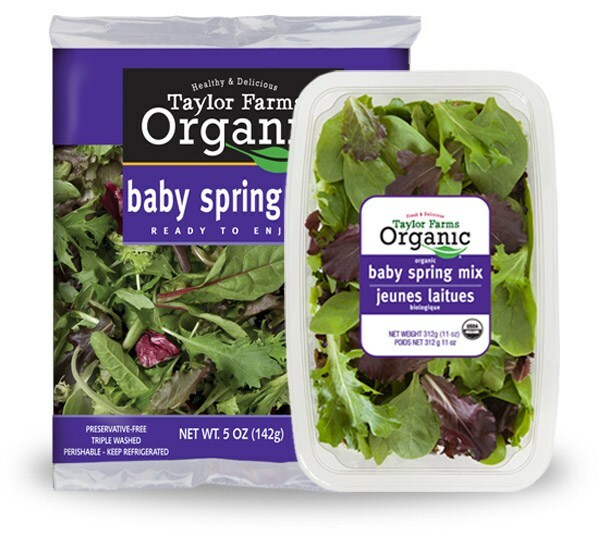 This week’s “Veggie Votes” have been tallied and we’re excited to feature the winner – Organic Baby Spring Mix! Great choice, voters! It’s springtime, so it’s the perfect time to highlight this medley of savory baby lettuces. Taylor Farms’ organic products carry the certified organic seal – meaning they are grown without the use of chemicals and synthetic fertilizers. Our farming families also grow with cultural, biological, and mechanical practices that conserve biodiversity. Now that’s something to feel good about! And, to make it even easier to get these greens into your family’s diet, we’ve rounded up a few fun and delicious salad recipes that are perfect for Spring – including our NEW Beet & Couscous salad developed just this week. Enjoy! Place Organic Spring Mix on a large serving plate or in a large salad bowl. Top with all ingredients. In a bowl mix all dressing ingredients and whisk well. Drizzle dressing on salad and toss. Add salt and pepper to taste – serve immediately. Want your voice to be heard? Check out the next round of “Veggies Votes” on our Instagram Story on Monday, April 23, and keep sharing your #GoToGreens photos on Instagram and Twitter for a chance to be featured on our feed!